Starring: Jason Yachanin, Kate Graham, and more. Per request of Ben (VanBrockalockalypse) Van Brocklin. 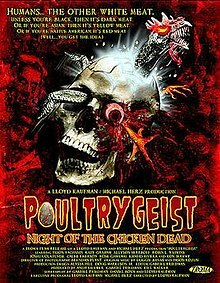 I watched (attempted) ‘Poultrygeist: Night of the Chicken Dead’. Um, let us just skip to the review part, shall we? I did not make it passed ten minutes of this film. Just everything about it turned me off. Every element of it, everything, and I can sit through most bad movies. Respect to the cult following for this one but I will not be one of them. 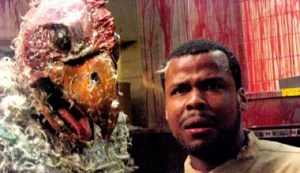 Stupid fake gore, horrendous acting, terrible pun-y jokes, just…no. Accurate representation of my expression during the 10 minutes.